Professionally, I might be described as a “working actor.” Tim's bio For most of the first half of 1982, while temporarily without paying work in the theatre, I had been donating enormous amounts of time and creative energy doing readings, backers’ auditions, and workshops of new musicals (and a play or two). I was working for nothing (actually for “reimbursement of expenses”) but, like my fellow artists, I considered these efforts and most of the shows themselves, to be worthy projects. Sadly, our collective attempts to get these new shows into some production track were unsuccessful. In those days, at the end of Broadway’s Golden Era, the country was in the midst of a "downturn." The American economy was discouraging risk. And with active producers in short supply, creators got very little help. The unions and colleges provided a few artist services. But organizations focusing on the development of new musicals were few and far between. Though, as a “working actor,” I knew the truth: that there were plenty of good new musicals floating around, and the major papers, typically uninformed, were screaming that THERE WEREN’T ANY NEW ONES BEING WRITTEN. That did not help the situation. Hardest hit during this period were the actors and the writers. For every worthy new show that doesn’t get produced, as many as 15 or more actors are deprived of work. Creators (composers, lyricists and book writers), whose efforts to complete a successful collaboration may take a year or more, suffer the most in that economic environment. In the early 1980s, it was a matter of some concern that many of our best creators were turning away from live theatre toward work in the commercial media — a great loss and potential disaster for the art form. It was a very frustrating time. Of the dozen new musicals that I had worked on during that 12-month period, some (though not all) really deserved to be produced for paying customers. Actors have a pretty good sense about these things. Then, one evening during the summer of 1982, alone in my house, reflecting on a recent discussion I’d had with two theatre friends (Sheldon Harnick - legendary lyricist - and Paulette Haupt - Artistic Director of the O’Neill Theatre Center - one of the few musical theatre development programs that existed at that time), I experienced an epiphany -- a marvelous vision that excited me greatly. What occurred to me on that hot summer night was that the plight of writers, and, by extension, the rest of the theatre community, might be relieved by the insertion of two additional interlocking programs into the professional development process: one to provide writers with constructive, comprehensive feedback (evaluation) from professional directors, and the other to publicly showcase - in the inexpensive “staged reading” format - the most worthy candidates from each annual crop of new works submitted for evaluation. I thought: if I can construct this program, it might produce significant benefits for the industry and, ultimately, the culture. In spite of what I realized were enormous obstacles, I resolved to make it happen. Looking back, that evening changed my life significantly in every way. These ideas evolved into the two original core programs of the National Music Theater Network, Inc. (NMTN), the 501c3 that I founded with two partners, Maggie Harrer and Jeffrey Kittay, in October of 1983. One other crucial element shaped NMTN’s goals and programs. Outside of New York were, and are, hundreds of potentially suitable development opportunities that, at the time, were not AT ALL active in that area. Since New York-based producers, dazed by the recession, were not willing nor able to take risks, I built into the company’s mission the intention to somehow alert the regional theatre community about the identity and availability of these superior shows. In 1983, the company was chartered; the first 25-member Evaluation Committee was assembled, procedures were refined, the submission and evaluation forms were composed — a modest solicitation campaign yielded about 50 submissions — and The Evaluation Program lurched into action. Each submission was (then, as now) thoroughly critiqued by two theatre professionals: directors, musical directors, or choreographers. Completed written Evaluation Reports were returned to the creative teams and excerpts of the highest-rated pieces were performed in NMTN’s first “Concert of Excerpts” presented in 1984 during the inaugural season of Philadelphia’s American Music Theatre Festival (producers: Marjorie Samoff and Eric Salzman). For 25 years, NMTN’s Evaluation Program has provided helpful editorial advice to creators of new works, and has identified the most promising submissions annually. For the first two years of NMTN’s existence, a published catalogue detailing the specs of each “Recommended Work” was sent to regional theatres all over the country. However, the catalogue failed to inspire an encouraging response, and that program was aborted. Ultimately, we concluded that the most potent way to attract potential developers was through live presentations of all, or portions, of the best new works. Since 1984, NMTN has presented thousands of public performances featuring new works, starting with excerpts, scenes, and songs, and, in 1991, graduating to full-length staged readings. Most of these presentations have been in New York City. 1984: First public performance. “Excerpts of New Musicals” in Philadelphia (AMTF). 1984-6: Publication of “Catalogue of Recommended Works.” Sent to 200+ theatres & producers. 1985 & 1986: Annual concert of excerpts of new works in NYC. 1985-7: Seagram’s New Music Theatre Awards (2 winners each year – one musical and one opera). 1986-90: “NMTN Sampler Series” developed by Executive Director Jay N. Stephens -- Monthly concerts of excerpts of new works. 1990-present: NMTN Sampler Series evolves into the “Songbook Series” developed by Project Director John Znidarsic. Monthly concerts of theatre songs by featured creators. (Spun off in 1994 to Arts and Artists at St. Paul’s). 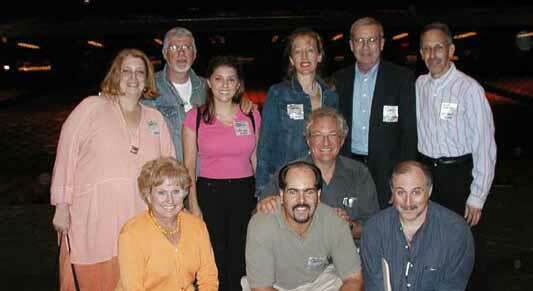 1991-1997: The Broadway Dozen – New York’s first annual festival of full length staged readings of new musicals. 12 per year. 1998-2005: BroadwayUSA/NY presentations – A smaller version of The Broadway Dozen featuring 3 musicals. Concert readings. Designed to be portable and suitable for regions. 2002: BroadwayUSA! In Chicago, IL (3 shows – in 3 venues). Joint program w/Oakton Community College. 2003: BroadwayUSA! In Sarasota, FL (2 shows). Partnered with Asolo and TheatreWorks. 2004-present: The New York Musical Theatre Festival – The world’s largest annual festival of new musicals - located in New York City. NMTN's public presentations were directly or indirectly responsible for generating development and/or production opportunities for many of the new works featured. It became clear that if our staged readings were more widely presented, development opportunities would be multiplied proportionally. In 1996, NMTN began developing a program that would increase its impact on the regional community. NMTN re-organized and strengthened its Evaluation Program, adding two stages of competitive selection to identify three shows annually that NMTN presented in a new performance program launched in 1997 - BroadwayUSA! to present the annual (re-named in 2006) Directors Choice Awards (DCA) winners. The program was successfully tested outside of New York through the cooperation of regionally-based affiliates who produced the series in their local communities. Financial and structural problems prevented the regional program from taking root and growing in its early form. In 2003, despite warnings that launching a festival featuring in excess of 10 shows would incur excessive risk, NMTN, guided by the vision of its then Executive Director Kris Stewart, began preparations for the 2004 debut of The New York Musical Theatre Festival (NYMF), and scheduled over thirty shows. To everyone’s surprise, NYMF instantly became the darling of the New York musical theatre scene with attendance figures at 88% across the entire festival. The three works selected by the Evaluation Program - the DCA winners – were presented during each NYMF season until 2008. At that point, some major changes were made that affected NMTN and my own involvement with these programs. 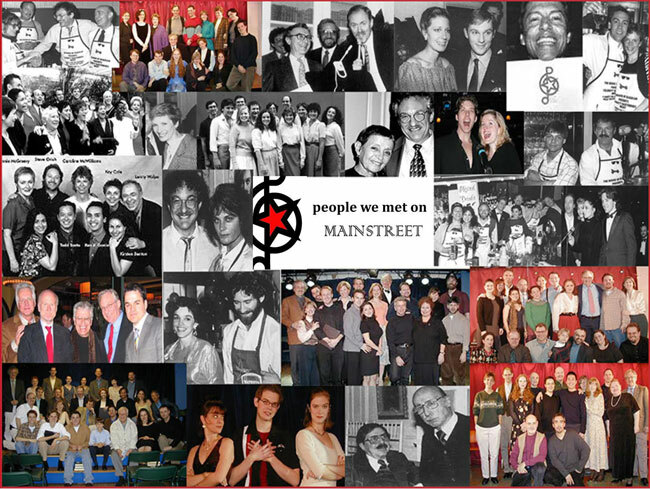 In 2008, I resigned from NMTN and, in 2010, I started MainStreet Musicals. The story of this project continues from there. The new company's governance, different from NMTN’s structure, is weighted towards the artists. Seven theatre communities (delegations) are represented on the board: Writers, Directors, Actors, Regional Affiliates, Educators and Students, Producers and Artistic Directors, Other Theatre professionals and Audiences. Four of the seven are artist delegations. Modeled on the principle that carefully targeted and centrally coordinated industry collaborations can produce significant benefits for all involved, MainStreet’s programs enrich the entire Theater Community. CREATORS: Guiding new works along effective, lower risk, economically feasible paths through the stages of development that lead to production. DIRECTORS: Increasing the number and accessibility of new works ready and available for artistic collaboration. PERFORMERS: Increasing the number and quality of locally available performance opportunities. PRODUCERS and ARTISTIC DIRECTORS: Expanding the number of new projects ready and available to move from script to initial production. COLLEGES and HIGH SCHOOLS: Inspiring and encouraging the next generation of artists, producers, educators and consumers via involvement with contemporary works of superior quality. THEATRICAL TRADE ASSOCIATIONS: Stimulating awareness of, and appreciation for, other collective organizations throughout the industry. AUDIENCES: There’s more to life than watching movies at home! MainStreet invites you to experience the thrill of seeing “tomorrow’s hits today” ... and at bargain prices. Visit the MainStreet Musicals blog. 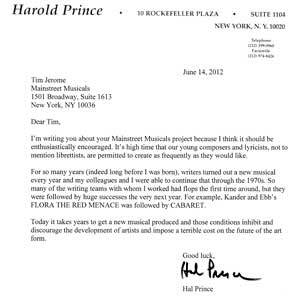 Read the endorsement by famed Director & Producer Harold Prince. NMTN BOARD OF DIRECTORS: (front row) Mary Ellen Ashley, Joe Romano, Geoff Cohen, (kneeling) Tim Jerome, (back row) Anne Bernstein, Martin Charnin, Jen Waldman (Staff Liaison), Barbara Schottenfeld (Chair), Terry Johnston, Lou Weiss. (photo taken on the Radio City Music Hall stage). MainStreet is proud to partner with HumanStage. MainStreet is proud to partner with Victor Herbert Source. ©2012 MainStreet Musicals. All Rights Reserved.